User Profile View. Now for the first time, you’ll be able to review and change your account settings all in one place—like your name, your avatar image, your contact information, and more. 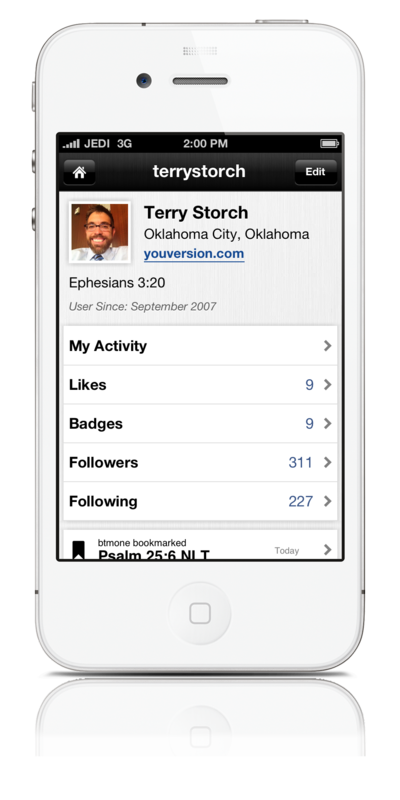 You can even browse your Friends’ profiles, and the profiles of people who are following you. Sign Up With Google. If you already have a Google account, you can sign up for your free YouVersion account using your Google login, right inside the Bible App. This makes creating your account one simple step, since you won’t need to verify your email address. Language Change. When you changed languages in your Bible App Settings before, it could cause the app to crash. Residual Popups. Sometimes on iOS 5, when a message popped up (such as from a launcher notification), you couldn’t make it go away. Long Book or Chapter Display (iPad). When trying to select from books with more than 30 chapters, or from chapters with more than 30 verses, the iPad wasn’t correctly displaying all of them. Main Reader View Distorted (iPhone). When you received a call or if you used your iPhone as a Wi-Fi hotspot, the notification slide-in was compressing the main Bible Reader view. On your Apple device, tap the App Store icon. When the App Store opens, tap the Updates icon. Tap Update for the Bible App. When the App Store opens, tap the Search icon. 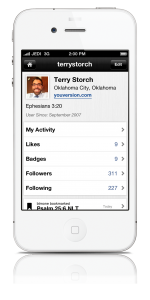 Tap the Bible App from LifeChurch.tv.